Let's talk pregnancy workouts and exercise. The main thing to focus on is staying active while pregnant. The number one thing I hate hearing is you are eating for two! NO YOU ARE NOT EATING FOR TWO!! Do not let that get into your head and aid in gaining excessive weight. I know there are days when you are dog tired and can barely move a limb, your back might be aching and/or your ankles swollen and hurting, maybe you're still in the beginning and nauseous all the time or some people have shared with me that they are simply too embarrassed to go into their gym out-of-shape they call it. Hey, pregnancy is a time where you are going to gain weight no matter what. You just want to make sure it is the healthy weight. I have found that personally I am not enjoying the gym as I use to. Which is fine as I was always a gym rat, runner and figure competitor, but being on a machine in a controlled environment and having people tell me their exercise opinions at the gym was just not a fit anymore. Plus, I tend to push it and challenge myself while in there and I do not want to hurt or harm myself in this stage so I sought out some other alternatives. Knowing that I always loved the Bar Method regular home DVDs, I ordered their Bar Method Pregnancy DVD. I also attend yoga and take many dog walks. I think I actually crave the natural vitamin D from the sunlight I get on my dog walks. Plus, there is something about being out in nature, with the trees, squirrels, sun and sky that is very connecting during this special time. My point is, stay active and try to do something if not every day, then 5 days a week. 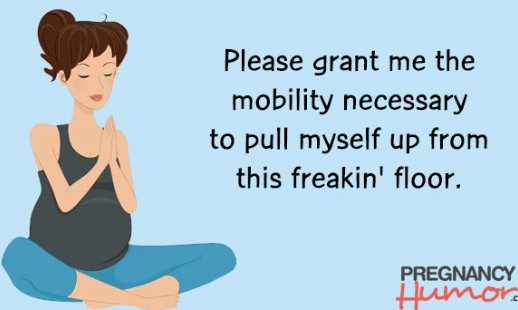 Exercise and pregnancy really go hand in hand helping you to prepare for labor and birth. I have also gone swimming and that is another amazing form of exercise plus you are weightless. Below, I have listed a few of the benefits of exercising while pregnant. The pregnancy workout by the Bar Method is super fun and an awesome total body workout geared for being pregnant. Just when you think you are going to die, then its over phew! All three women in the video are pregnant and the instructor is pregnant with twins and looks amazing. Her voice is pleasing and easy to listen to and they have modifications for you if needed. I love this video and highly recommend it. Plus, you can take it on the go with you if needed. *Remember* always consult with your physician before starting any exercise, do not lie flat on your back after the first trimester, avoid contact sports, avoid activities that involve falling, be smart and exercise smart. Now is not the time to run a marathon and PR, got it?! What are you doing for workouts? Prego or not?